Attention, fellow parents. An important topic has been on all our minds for a while now, and it’s high time we discuss it as a group. It’s not exaggerating to say the ramifications of these decisions are no less important than the safety and sanity of future generations. Today, at Mobile World Congress in Barcelona, Avast announces a strategic partnership with Vodafone Czech Republic, one of the world’s top mobile carriers. Vodafone Security and Vodafone Family Security are two new apps that will protect Vodafone users with mobile security powered by Avast starting in Spring 2018. Today’s children are known as “digital natives.” That is, they were born into a world where “phone” is short for “smartphone,” not “telephone,” and staring at screens is more necessity than luxury. But at what saturation point does phone usage get unhealthy? How much is too much? Your iPhone data may require a court order for the FBI to look into the contents, but if you log onto an unsecure Wi-Fi hotspot without protection, any old snoop can eavesdrop on what you’re doing. That’s right, while you’re busily messaging, shopping, banking, and uploading a photo of your lunch to Instagram, a hacker with a little know-how can easily read your messages, steal your logins, passwords and credit card details. Even if you are connected to a recognizable Wi-Fi network, your device has no way of distinguishing a securely encrypted public Wi-Fi from one that is not. Unsecured routers are susceptible to DNS hijacking, by which cybercriminals redirect web traffic to fake Internet sites. When users log in, for example, to a banking site, thieves can capture the login credentials. On unprotected Wi-Fi networks, thieves can also easily see emails, browsing history, and personal data if you do not use a secure or encrypted connection like a virtual private network (VPN). 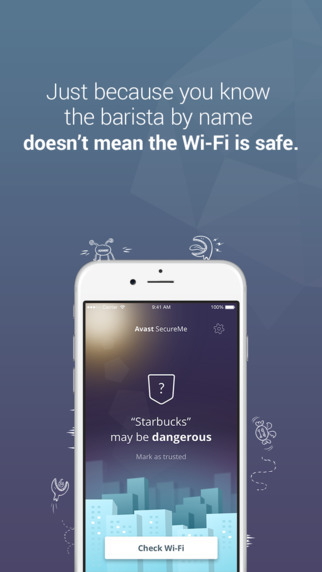 Avast SecureMe is a free app for iPhones and iPads which protects you while connected to Wi-Fi.